In the workplace and during a job search, it’s important you are keeping up with the times. And I’m not just talking about the newest technology. There are new ways of doing business, interacting with customers and clients, and even new types of jobs and career paths. It has become our responsibility to manage our career. This weekly summary highlights some of the new workforce trends and practices in recruiting and hiring you’ll want to keep up with! From trends in training, social recruiting, new types of jobs, and classic interview tips, this week’s summary is sure to up your knowledge on all things career-related! While this article talks about CPG (consumer packaged goods), the five steps apply to any organization! I hope you uncover some new ideas! Micro-learning or on-demand learning is rising. Flip through this presentation to learn why changes in jobs, careers and training have been changing and what companies are doing to upskill employees! I’m a trainer at heart and love data, so this presentation hit all the right buttons for me. It is unlikely that robots will steal your job. BUT, you have to change your thinking and strategy. There are six very concrete steps you can take to make sure you stay employable. Make sure you block time for them! When a recruiter tells you how they research candidates, you really should pay attention. That’s exactly what this article does! It’s up to you to make sure recruiters, hiring managers and anyone looking for public information about you finds the best stuff. Job interview tips all wrapped up in one easy infographic. I’ve always enjoyed my conversations with Mark! Here’s another quick one! 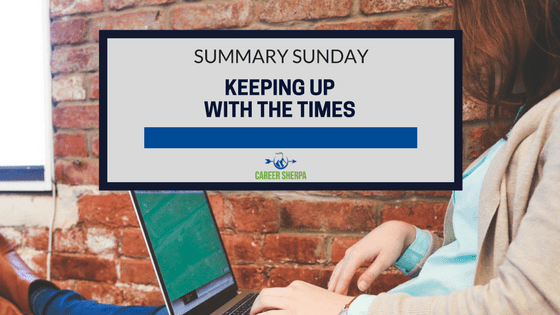 The post Summary Sunday: Keeping Up With The Times appeared first on Career Sherpa . Previous Previous post: What? You Aren’t Using An Email Signature?